Looking for the perfect place to stash your essentials this Halloween? Seeking out a satchel that will go with your Slytherin costume? Or perhaps you're just a huge fan of Hogwarts! Either way, this Danielle Nicole Harry Potter Slytherin Clutch will prove, well, clutch for a great night on the town! Halloween parties, trick-or-treating, even karaoke at your favorite bar—this purse can make every occasion even more magical. Don't believe us? Go ahead and stash your phone and keys inside and hit the town. Once you drape its chain strap over your shoulder, you'll practically be speaking Parseltongue! This is an officially-licensed bag, born from the elite lineage of designer Danielle Nicole and the world of Harry Potter! What could be better? 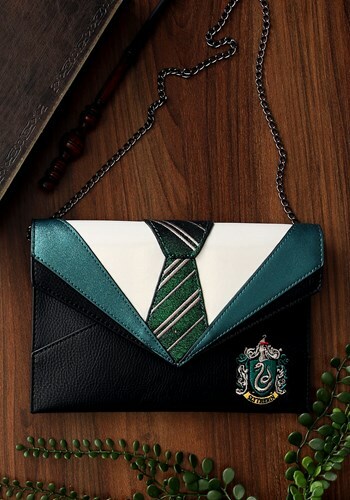 It's a cute envelope clutch decorated like a Hogwarts Slytherin uniform, complete with a shiny emerald lapel, black "robe," green and silver striped tie, and house crest! Inside the bag features a snap closure, card slots, and a chain strap. At the end of the day, each witch or wizard has to decide the legacy they want to leave behind for the Slytherins who will follow in their footsteps. So what'll it be? You may not have everything planned out, yet, but at least you can leave this Halloween having everyone know just how stylish you are!